If the ambient temperature of a temperature control installation changes significantly, there are several sources of potential inaccuracies that can be minimized by attention to installation details. Reflective Errors: For situations in which the IRt/c itself is at the same temperature as ambient sources of radiated energy, the patented design of the IRt/c will compensate for reflected energy and maintain accuracy. See Tech Note #64 for discussion. If the ambient source of radiant energy is too hot for an uncooled IRt/c, the principal precaution to employ is to take advantage of the generally specular characteristics of reflected energy. 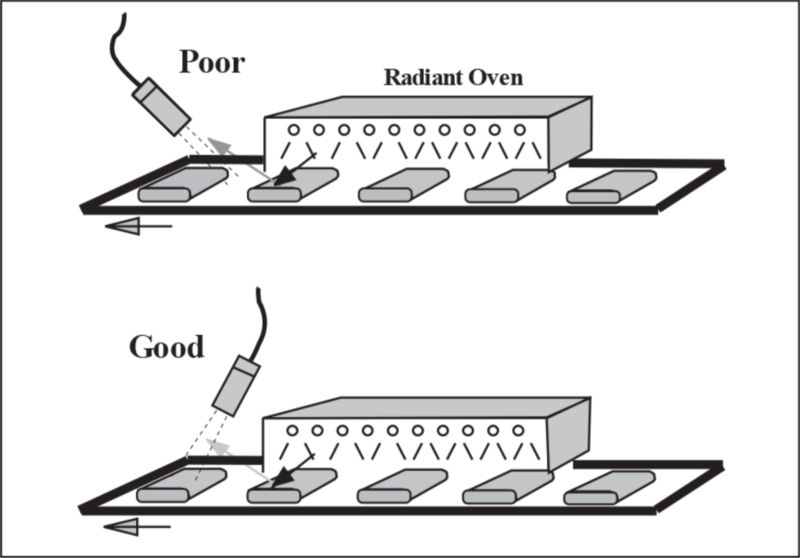 The term specular means “mirror-like,” and reflective errors can be minimized by avoiding viewing angles in which the surface can reflect a hot source. Leakage Current Effects: For installations in which the readout device generates appreciable leakage current, there is a potential inaccuracy due to small shifts in IRt/c impedance with ambient temperature. For example, if the readout device leakage current generates an offset of 100°F (55°C), which is calibrated out at installation, and sometime later the ambient temperature for the IRt/c is much hotter, the IRt/c impedance might be a few percent different than it was at calibration. Accordingly, the temperature offset caused by the leakage current will also shift by a few percent. If the original offset requirement is 100°F (55°C), then a shift of ~ 5% impedance will cause a shift in reading of ~ 5°F ( ~ 3°C). In general, always choose a readout device with the lowest leakage current available to avoid this potential problem. See Tech Note #14, #16, #37, and #56 for further discussions of leakage current effects.